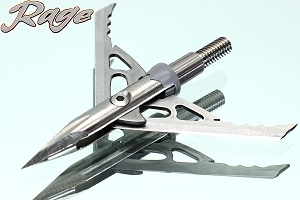 Rage Hypodermic 100 Grain Broadheads 3-Pack, Penetrates Toughest Game! 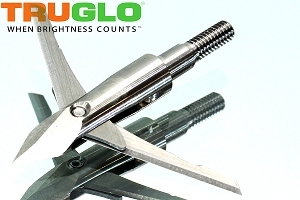 TruGlo Titanium X, Mechanical 2-Blade Broadheads, 3-Pack, NEW! Rocky Mountain Warhead, 2-Blade, 100 Grain Broadheads, 3-Pack, DEVASTATING! 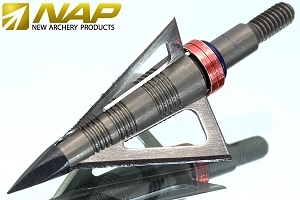 WHAT IS A BROADHEAD? A broadhead is basically a flying razor blade. This is the business-end of the hunting arrow. 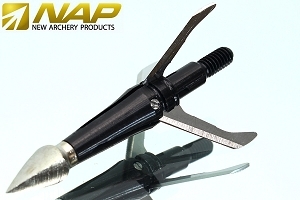 Broadheads are designed to cause death by hemorrhage and exsanguination. 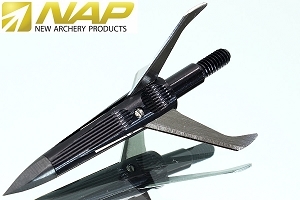 A good broadhead flies straight, penetrates the target deeply and slices through soft tissue like butter. We know it sounds gruesome, but the more brutally effective a broadhead is, the more ethical the game harvest it yields. A perfectly placed shot with a high quality broadhead can bring big game down in mere seconds. So when it's time to unscrew the practice tips and load the real ammunition, you want the best broadhead you can get your hands on. Speaking of "hands on", be advised that broadhead blades are sharp. Be very careful when handling broadheads. They will easily slice through clothing, fingertips, YOUR BOW STRING, etc. If you even touch your razor sharp broadhead blade to your high-tension bow string, it's all over. 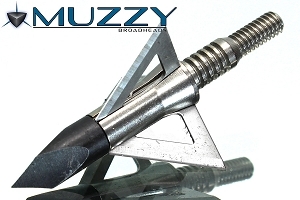 FIXED-BLADE vs MECHANICAL` As the heading implies, some broadheads are designed to work like a simple kitchen knife, with a fixed blade configuration (Muzzy MX-3, NAP Thunderheads, etc.) 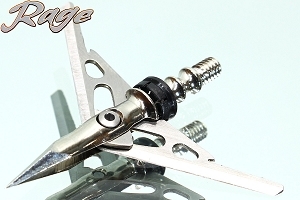 while other broadheads are designed more like a switchblade knife, where the blades are deployed by some mechanical action (Rage Hypodermic, NAP Spitfire, etc.). The choice varies by personal preference and purpose, but bowhunters usually have strong opinions about which broadheads they think will work best. It's also worth noting that some states restrict broadhead type and/or cutting diameter. 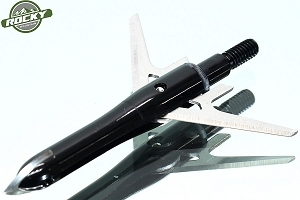 Know the laws in your state before you choose your hunting broadheads.